Children’s feet need to last them a lifetime, so it’s important to start taking care of them from birth. That’s why pediped® designed the pediped® footwear system to protect your child’s feet—all the way from crawling to those first amazing steps and into childhood. 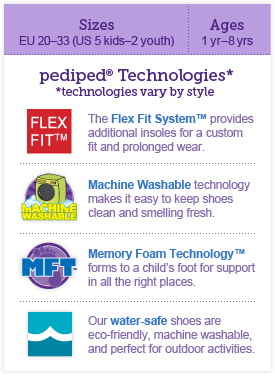 pediped Flex® is the big step in the pediped footwear system and the ultimate shoe for confident walkers who have developed a solid, natural stride. Flex® combine everything you could want in a rubber soled shoe: high quality materials, soft and flexible soles, and adorable styles. Each pair uses advanced technology to maximize the flexibility and absorb shock in the heel. The uniquely engineered density of the rubber soles ensures they flex to their maximum capacity. Most Flex® styles include the Flex Fit System™, which provides a customizable fit with the use of additional insoles. These can be inserted for a snugger fit at the beginning and then removed as the foot grows. The Flex Fit System™ can extend the life of a pair of shoes up to two months! pediped Flex® are the perfect, stylish choice for all-day wear and non-stop comfort.